28-Day Upper Body Challenge – Done! 7mins 30secs high to low plank. I told you that it was no ordinary push up challenge and look at that – YOU MADE IT! The LGF 28-Day Upper Body Challenge is officially complete. The end is nigh! Just five more ‘work’ days and you will be able to say that you completed the LGF 28-Day Upper Body Challenge. Or as I like to call it, Hell. Congratulations! You’re officially halfway through the challenge! By now you should be powering through those first few reps with perfect form, feeling stronger, happier and pretty damn proud of yourself! It’s Monday morning, which can only mean one thing…. Week 2 of the LGF 28-Day Upper Body Challenge starts today! 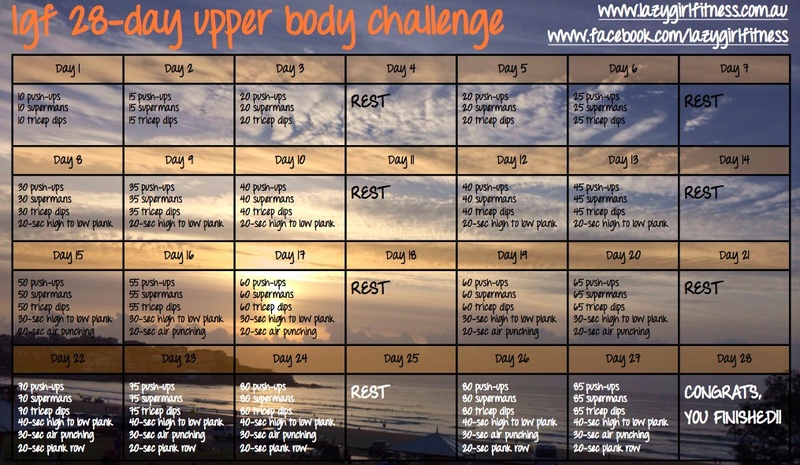 Woohoo, it’s finally arrived – HAPPY FIRST DAY OF THE LGF 28-DAY UPPER BODY CHALLENGE TEAM! Ever since I designed the first LGF Challenge back in August last year, I’ve had people messaging me asking when I would be putting together an upper body challenge. To be honest with you, I’ve been avoiding it a little bit because finding quality upper body exercises that you can do without equipment is hard, and I didn’t want this to be just another push up challenge. But I’ve finally done it. And now, in just four short weeks you will be feeling like a fitter, stronger, more defined version of yourself… how exciting is that?